The da Vinci Program (DVP) in the UM College of Arts and Sciences (A&S) - inspired by the artist, humanist, and scientific genius Leonardo da Vinci - aims to enhance the opportunities for incoming freshman and sophomore students to explore the interdisciplinary connections among the sciences, social sciences, arts, and humanities. 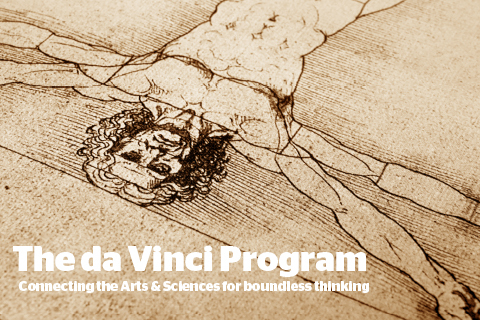 The da Vinci Program encourages students to rethink the map of human knowledge. It emphasizes connections between humanistic and scientific inquiry and their modes of understanding: objectivity, critical analysis, self-reflexivity, the nature of proof, authority, and the logic and rhetoric of written expression. It also helps define the distinctive elements that humanities classes can offer to STEM-minded students: a chance to reflect on questions of human values, ethics, and aesthetics. At the same time, it introduces humanities students to conceptually new means of investigating the traditional fields. ● discovering how such separations can be questioned and bridged. This course will examine scientific narrative as a form that has evolved over time. We will begin with the Greek oral tradition, as it has come down through Roman texts; then, we will read English translations of early Modern medical writers, including Bartholomeus Metlinger of Augsberg and the female physician Trotula of Salerno, and consider the drawings of Leonardo da Vinci, Andreas Vesalius, and other Renaissance anatomists. After considering the foundations of modern scientific method as laid down by Francis Bacon and René Descartes, and early influential medical researchers like Hieronymous Fabricius ab Aquapendente and William Harvey, we'll end with the establishment of the Philosophical Transactions of the Royal Society of London, which marked a major shift in the shaping of scientific narrative. ● Guest faculty from various disciplines will contribute. ● A research/class project involving either a photo lab/visual media project or research in digital humanities. DVP Program co-listed sections of regular course offerings, with an emphasis on interdisciplinary classes. Examples: History of Science; Medicine and Literature. ● Choose from a list of 5-6 seminars. ● Topics include a major contemporary ethical, intellectual, and aesthetic question. Examples: The Science and Poetry of Environmental Change; Medicine, Healing, and Religion. ● DVP students present on an interdisciplinary issue or question at a symposium open to the public. Q: How can I participate in the da Vinci Program? A: It is by invitation only to high-performing students. Q: How many students usually enroll in this program? A: The University Admissions Office extends invitations to a select group of high-achieving admitted students, of which only the first 40 to accept the invitation become each year's cohort. Q: Do I have to be a student in the College of Arts & Sciences to participate? A: Yes. You don’t need to have declared a particular major to be invited to the program.